A solution presented itself, however, in the form of the automobile, which took the world by storm after 1900. Powered by a small internal combustion engine burning diesel or gas, a heavily-armored vehicle could advance even in the face of overwhelming small arms fire. Add some serious guns and replace the wheels with armored treads to handle rough terrain, and the tank was born. 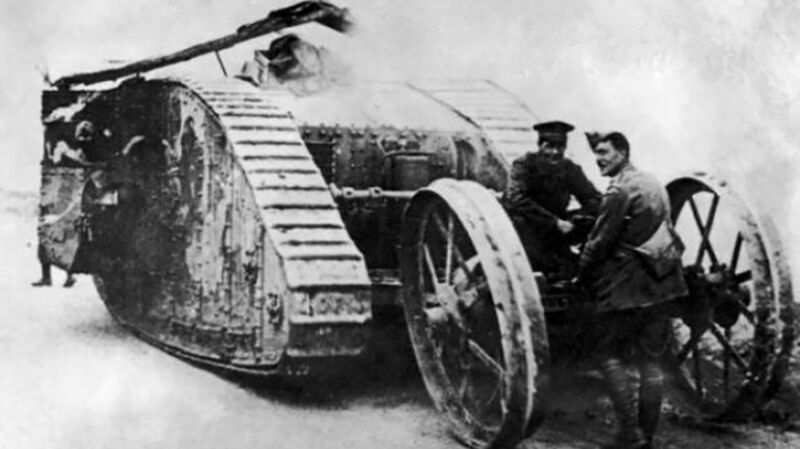 The first tank, the British Mark I, was designed in 1915 and first saw combat at the Somme in September 1916. The French soon followed suit with the Renault FT, which established the classic tank look (turret on top). Despite their later prowess in tank combat in WWII, the Germans never got around to large-scale tank production in WWI, although they did produce 21 tanks in the unwieldy A7V model. Although the Byzantines and Chinese used weapons that hurled flaming material in the medieval period, the first design for a modern flamethrower was submitted to the German Army by Richard Fiedler in 1901, and the devices were tested by the Germans with an experimental detachment in 1911. Their true potential was only realized during trench warfare, however. After a massed assault on enemy lines, it wasn’t uncommon for enemy soldiers to hole up in bunkers and dugouts hollowed into the side of the trenches. Unlike grenades, flamethrowers could “neutralize” (i.e. burn alive) enemy soldiers in these confined spaces without inflicting structural damage (the bunkers might come in handy for the new residents). The flamethrower was first used by German troops near Verdun in February 1915. Poison gas was used by both sides with devastating results (well, sometimes) during the Great War. The Germans pioneered the large-scale use of chemical weapons with a gas attack on Russian positions on January 31, 1915, during the Battle of Bolimov, but low temperatures froze the poison (xylyl bromide) in the shells. The first successful use of chemical weapons occurred on April 22, 1915, near Ypres, when the Germans sprayed chlorine gas from large cylinders towards trenches held by French colonial troops. 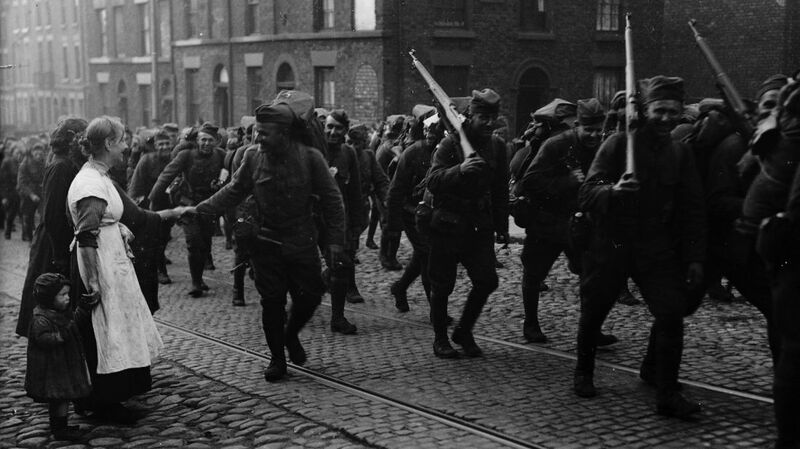 The defenders fled, but typically for the First World War, this didn’t yield a decisive result: the Germans were slow to follow up with infantry attacks, the gas dissipated, and the Allied defenses were restored. Before long, of course, the Allies were using poison gas too, and over the course of the war both sides resorted to increasingly insidious compounds to beat gas masks, another new invention; thus the overall result was a huge increase in misery for not much change in the strategic situation (a recurring theme of the war). 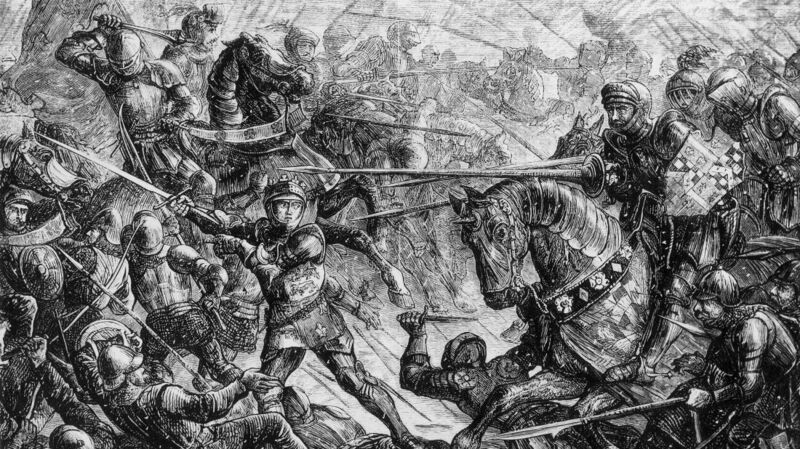 While the Great War involved a lot of futile activity, fighting at night was especially unproductive because there was no way to see where you were shooting. Night combat was made somewhat easier by the British invention of tracer bullets—rounds which emitted small amounts of flammable material that left a phosphorescent trail. The first attempt, in 1915, wasn’t actually that useful, as the trail was “erratic” and limited to 100 meters, but the second tracer model developed in 1916, the .303 SPG Mark VIIG, emitted a regular bright green-white trail and was a real hit (get it?). Its popularity was due in part to an unexpected side-benefit: the flammable agent could ignite hydrogen, which made it perfect for “balloon-busting” the German zeppelins then terrorizing England. Airplanes had been around for just a decade when WWI started, and while they had obvious potential for combat applications as an aerial platform for bombs and machine guns, it wasn’t quite clear how the latter would work, since the propeller blades got in the way. In the first attempt, the U.S. Army basically tied the gun to the plane (pointing towards the ground) with a leather strap, and it was operated by a gunner who sat beside the pilot. This was not ideal for aerial combat and inconvenient because it required two airmen to operate. Another solution was mounting the gun well above the pilot, so the bullets cleared the propeller blades, but this made it hard to aim. After the Swiss engineer Franz Schneider patented his idea for an interrupter gear in 1913, a finished version was presented by Dutch designer Anthony Fokker, whose “synchronizer,” centered on a cam attached to the propeller shaft, allowed a machine gun to fire between the blades of a spinning propeller. The Germans adopted Fokker’s invention in May 1915, and the Allies soon produced their own versions. Schneider later sued Fokker for patent infringement. In the first days of flight, once a plane left the ground the pilot was pretty much isolated from the terrestrial world, unable to receive any information aside from obvious signals using flags or lamps. This changed thanks to the efforts of the U.S. Army, which installed the first operational two-way radios in planes during the Great War (but prior to U.S. involvement). Development began in 1915 at San Diego, and by 1916 technicians could send a radio telegraph over a distance of 140 miles; radio telegraph messages were also exchanged between planes in flight. Finally, in 1917, for the first time a human voice was transmitted by radio from a plane in flight to an operator on the ground. The German U-boat campaign against Allied shipping sank millions of tons of cargo and killed tens of thousands of sailors and civilians, forcing the Allies to figure out a way to combat the submarine menace. The solution was the depth charge, basically an underwater bomb that could be lobbed from the deck of a ship using a catapult or chute. Depth charges were set to go off at a certain depth by a hydrostatic pistol that measured water pressure, insuring the depth charge wouldn’t damage surface vessels, including the launch ship. After the idea was sketched out in 1913, the first practical depth charge, the Type D, was produced by the Royal Navy’s Torpedo and Mine School in January 1916. The first German U-boat sunk by depth charge was the U-68, destroyed on March 22, 1916. Of course it was a big help if you could actually locate the U-boat using sound waves, which required a microphone that could work underwater, or hydrophone. The first hydrophone was invented by 1914 by Reginald Fessenden, a Canadian inventor who actually started working on the idea as a way to locate icebergs following the Titanic disaster; however, it was of limited use because it couldn’t tell the direction of an underwater object, only the distance. The hydrophone was further improved by the Frenchman Paul Langevin and Russian Constantin Chilowsky, who invented an ultrasound transducer relying on piezoelectricity, or the electric charge held in certain minerals: a thin layer of quartz held between two metal plates responded to tiny changes in water pressure resulting from sound waves, allowing the user to determine both the distance and direction of an underwater object. The hydrophone claimed its first U-boat victim in April 1916. A later version perfected by the Americans could detect U-boats up to 25 miles away. The first time an airplane was launched from a moving ship was in May 1912, when commander Charles Rumney Samson piloted a Short S.27 pontoon biplane from a ramp on the deck of the HMS Hibernia in Weymouth Bay. However, the Hibernia wasn’t a true aircraft carrier, since planes couldn’t land on its deck; they had to set down on the water and then be retrieved, slowing the whole process considerably. The first real aircraft carrier was the HMS Furious, which began life as a 786-foot-long battle cruiser equipped with two massive 18-inch guns—until British naval designers figured out that these guns were so large they might shake the ship to pieces. Looking for another use for the vessel, they built a long platform capable of both launching and landing airplanes. To make more room for takeoffs and landings, the airplanes were stored in hangars under the runway, as they still are in modern aircraft carriers. Squadron Commander Edward Dunning became the first person to land a plane on a moving ship when he landed a Sopwith Pup on the Furious on August 2, 1917. The first pilotless drone was developed for the U.S. Navy in 1916 and 1917 by two inventors, Elmer Sperry and Peter Hewitt, who originally designed it as an unmanned aerial bomb—essentially a prototype cruise missile. Measuring just 18.5 feet across, with a 12-horsepower motor, the Hewitt-Sperry Automatic Aircraft weighed 175 pounds and was stabilized and directed (“piloted” is too generous) with gyroscopes and a barometer to determine altitude. The first unmanned flight in history occurred on Long Island on March 6, 1918. In the end, the targeting technique—point and fly—was too imprecise for it to be useful against ships during the war. Further development, by attempting to integrate remote radio control, continued for several years after the war, until the Navy lost interest in 1925. With millions of soldiers suffering grievous, life-threatening injuries, there was obviously a huge need during the Great War for the new wonder weapon of medical diagnostics, the X-ray—but these required very large machines that were both too bulky and too delicate to move. Enter Marie Curie, who set to work creating mobile X-ray stations for the French military immediately after the outbreak of war; by October 1914, she had installed X-ray machines in several cars and small trucks which toured smaller surgical stations at the front. By the end of the war there were 18 of these “radiologic cars” or “Little Curies” in operation. African-American inventor Frederick Jones developed an even smaller portable X-ray machine in 1919 (Jones also invented refrigeration units, air conditioning units, and the self-starting gasoline lawnmower). Women traditionally improvised all kinds of disposable or washable undergarments to deal with their monthly period, all the way back to softened papyrus in ancient Egypt. But the modern sanitary napkin as we know it was made possible by the introduction of new cellulose bandage material during the First World War; it wasn’t long before French nurses figured out that clean, absorbent cellulose bandages were far superior to any predecessors. British and American nurses picked up on the habit, and corporate America wasn’t far behind: In 1920, Kimberly-Clark introduced the first commercial sanitary napkin, Kotex (that’s “cotton” + “texture”). But it was rough going at first, as no publications would carry advertisements for such a product. It wasn’t until 1926 that Montgomery Ward broke the barrier, carrying Kotex napkins in its popular catalogue.